Mr Ramaphosa was hoping to canvass votes for the governing African National Congress (ANC) which he leads after replacing Jacob Zuma last year. A reporter based in Johannesburg wondered whether the spectacle was “the greatest-ever metaphor for South Africa”. President Ramaphosa staring out the window of a stalled train: greatest-ever metaphor for South Africa? While an opposition politician quipped: “New driver, same broken old train”. The metaphor. 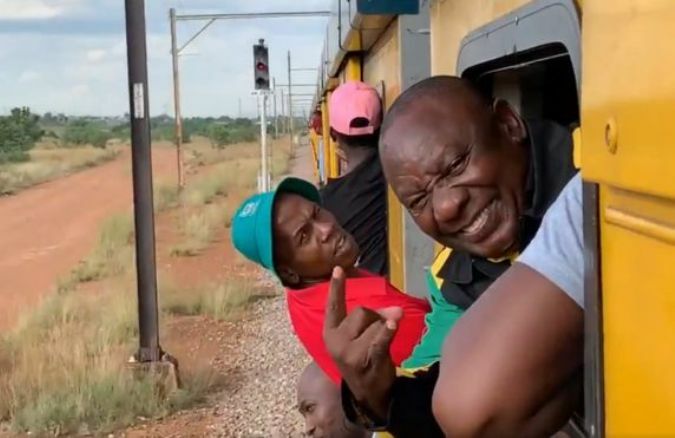 Ramaphosa in trains that break down daily, but he is all smiles. His face says don’t worry about the broken ANC, vote for for me, not the ANC. Trust me even though it is beyond impossible to fix the ANC, I’m just a passenger here. New driver, same broken old train.